Dr. David Rain (Tom Arden is a pseudonym) used to teach English Literature at Queens University in Belfast but now he lectures at Middlesex University, London. 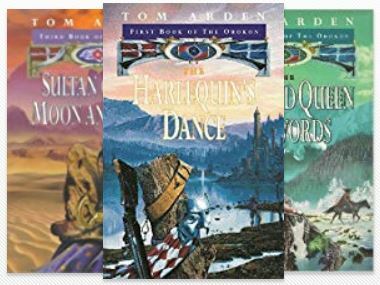 I got 67 pages (eight chapters) into Tom Arden's The Harlequin's Dance (1997), and even those 67 pages were a struggle. In fact, I started and stopped the book a few times before finally giving up. I'm a little disappointed, because it seems like there's potential here. Characterization is thorough, there are some promising villains, and some subtle humor — all things that I appreciate. Cata wiped her nose on her wrist. A grey squirrel was looking at her quizzically. She closed her eyes. For a moment she saw herself as the squirrel saw her: a little girl hunched on her mother's grave, forlornly tormenting a lifeless doll. Shadow Black — (2001) Publisher: England, 1955. Harriet Locke accepts an invitation to the seaside mansion of Shadow Black and looks forward to joining her fiancé Mark Vardell, the handsome avant-garde artist who is painting the reclusive Lord Harrowblest. Her life is about to change, and change forever, in a household of bizarre characters bound together by ties of deceit, lust and half-truths. At Shadow Black, Harriet meets Yardley Urban, faded Hollywood goddess, and Cora Van Voyd, elderly, seven-times-married gossip and grande dame. There is crippled, embittered media mogul Lord Harrowblest and his faithful servant Collidge; pathetic, drunken songwriter Jellicoe Travers; Milly, the hare-lipped parlourmaid; and Toby Chance, the lonely fifteen-year-old science fiction fan who somehow links them all together. And then there is Mr Vox, mysterious agent of a force that will tear away the veils of deceit from Shadow Black, and from Harriet too, in a climax that boldly mingles fantasy, social comedy and gothic horror. The Translation of Bastian Test — (2005) Publisher: On a rocky Scottish coast lies Castle Drumhallurick, ruinous home of a long-lost laird. But who is the reclusive millionaire who has taken over the castle? And what is it that links him to a fantastical alien world, circling the faraway star system of Antares? It is 1926, and a horrifying scientific experiment is about to unfold, altering forever the life of a boy called Bastian Test. For all his life, Bastian has been kept in seclusion, shut away from the world by his eccentric artist mother. Now, after her sudden death, Bastian learns that he has a guardian he has never heard of before, and a mysterious destiny that lies in wait for him on the rocky shores of Drumhallurick.